So this has very little to do with Oracle, but it’s the big thing everyone has been asking me about over the past two or three weeks. If you’re a vegan or a vegetarian, you may want to stop reading right now. Thanksgiving is coming up here in the States. It’s a bit deal in terms of remembering what to be thankful about. It’s also a big deal in terms of cooking, especially cooking turkey. Y’all asked for it, so here it is: this is my best recipe for cooking a Thanksgiving turkey. This will make about 18 servings. In a large saucepan over high heat, bring the water, salt and sugar to a boil. Be sure you’re stirring to dissolve the salt and sugar. Once boiling, turn off heat and let cool to room temperature. In a 3-gallon food-safe container (I use a food storage bucket or a camping cooler), combine one gallon of water with the oranges, cloves, bay leaves and peppercorns. Add the sugar-salt solution and stir. Congrats! You’ve made the brine! Remove the giblets and neck from the turkey (I keep ‘em around for making gravy). Remove excess fat and pat the turkey dry with paper towels. Submerge the turkey in the brine. Top it off with a weight if needed to keep it submerged. If the turkey is a bit large, add more water. Keep the turkey and brine in the refrigerator for 12 hours. While the turkey is soaking in the brine, make your glaze. Stir all three ingredients in a small bowl. Cover and refrigerate until one hour before the turkey is done cooking. Don’t worry, we’ll use this in a bit. If you’re cooking in a smoker, load the smoker with apple or cherry wood and start your fire. If you’re grilling, set up your grill for indirect medium heat (google this if you need instructions). If you’re cooking in the oven, pre-heat to 325 degrees F.
Remove the turkey from the brine and pat it dry with paper towels. Brush all over with a thin coating of the olive oil. Do not season, as the brine soak took care of that. Put your turkey in a large foil roasting pan. Place the turkey, still in the roasting pan, in your smoker/grill/oven breast side up!!! Close the lid or door and find something else to do - don’t peek. If you’re grilling or oven roasting, plan to cook around 13 minutes per pound. In a smoker, figure it closer to 30 minutes per pound - yeah, that’s a long cook, so plan accordingly. NOTE: if you’re grilling or oven roasting, you’ll likely miss out on most of the wood smoke flavor. Grab some Liquid Smoke in Applewood flavor from the BBQ Sauce section of your local grocery - add in a teaspoon when you’re making the glaze; it’s not the same, but it’ll fool most people. Just keep in mind that too much will make your turkey taste extremely bitter, so err on the light side. Discard your brine. You’re all done with it. After two hours, begin basting with a combination of orange juice plus either water or apple juice (not both! ); I prefer apple juice - more moistening and leaves no flavor behind, but to each his/her own. Baste every two hours until the glaze is applied. One hour before the turkey is done cooking, remove the glaze from the refrigerator and let sit at room temp. 30 minutes before your turkey is done cooking, remove the turkey from the foil pan. See all the drippings in your pan? That’s for the gravy. Grab the can and put the turkey breast up directly on the cooking grate. Close the lid or door and go make your gravy. 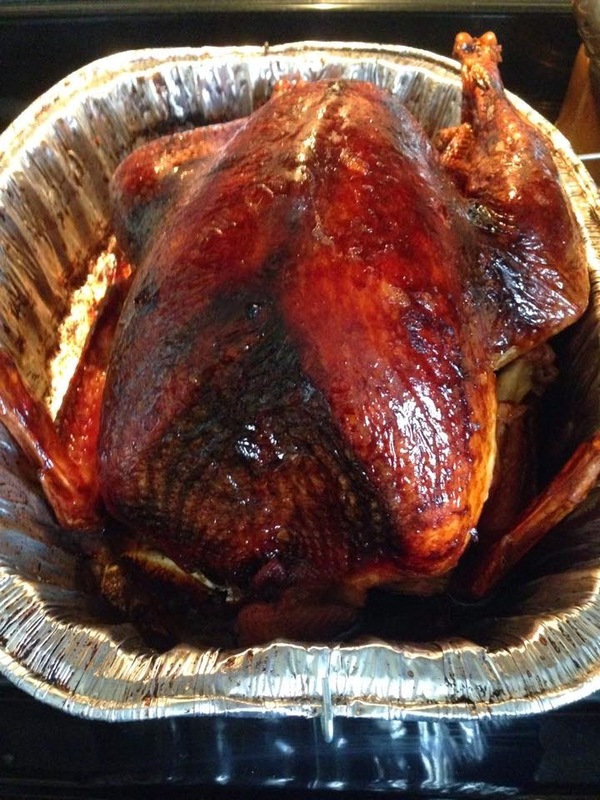 When you grab the pan and drippings for the gravy, brush the glaze all over your turkey. Your turkey is done when an instant-read thermometer inserted in the thickest part of the thigh reads 180 degrees F. Don’t have an instant-read thermometer? Stick a toothpick in the thickest part of the thigh without touching the bone; remove the toothpick and inspect the juices running out of the hole; your turkey is done when the juices run clear. When your turkey is done, remove from the heat to a platter and (very important) let it stand for 20 minutes at room temp before carving! But wait, you say, what about stuffing??? Truth is, using this recipe, the inside of the bird will never get hot enough to entirely cook the stuffing. I cook my stuffing in an aluminum pan on top of the stove…usually add a teaspoon or two of the drippings while it’s cooking. If I want the bird stuffed, I’ll stuff it while it’s standing after the cooking is done…yeah, I normally don’t do this…never have heard any complaints. One note about something everyone fusses over: carving. I use an odd technique taught to me by a professional butcher - it keeps the meat juicier, avoids shredding the meat, and makes the overall presentation much better. First, remove the entire breast from the bone in one large cut. Cut across the breast to make crescent-shaped pieces. Move the pieces to the serving platter as a whole breast, then cut off and add the drumsticks, thighs and wings. So there ya go! We'll get back to the Oracle stuff next week. In the meantime, enjoy and have a happy Thanksgiving! No photos, Floyd? I was looking forward to those as well! I hope that you and yours have a fabulous Thanksgiving holiday!